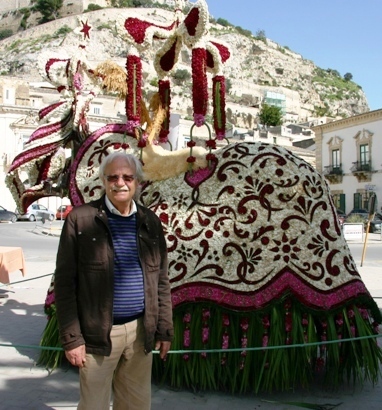 Since I wrote the post below, we’ve been to Sicily’s St. Joseph festivities many times, and have now added them to our Walking and Cooking in Eastern Sicily tour March 15-21, 2019, with a special offer on the last 2 rooms on this unique tour! 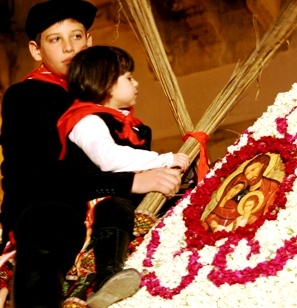 If it weren’t for the premise that the Cavalcata of San Giuseppe reenacts the flight of Joseph, Mary and the baby Jesus to Egypt, it hardly feels like a religious celebration in the town of Scicli in Sicily. It’s more like a tribute to the majestic power of horses, and the fantastic heady feeling of being on horseback high above the crowd, with the whole town looking at you. 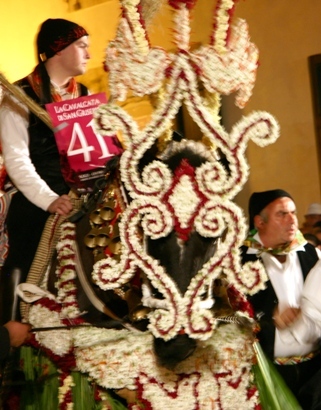 The Sicilians love for theatrical events is evident not only in the lavish flower decorations on the horses, but also in their obvious pleasure in dressing the part – their traditional costumes of black velvet pants and vest (some embroidered with colorful flowers), crisp white shirt, a black stocking cap, and dashing red scarves, were worn with a proud swagger. Astride the horses were fathers with tiny children, or young boys who looked perfectly at home clutching the reins of a huge horse, their feet dangling high above the horse’s flank. Some horses were only lightly decorated – with bells, and open-weaved decorations of flowers on their harness – while a half-dozen where in complete bardatura, dressed-up in splendid cloaks and headdresses made of flowers, and competing for first prize. Instead of the heavy wooden frame of yesteryear, the horse’s costumes are made of foam rubber decorated with intricate designs of flowers called violaciocca – this is commonly known as the wallflower, now for once the life of the party! One fellow who had participated in the making of one of the costumes explained that it took 10 people a day and half – with “liters of coffee” – to complete a horse’s costume with the application of thousands of flower blossoms. In the hours before the festival officially began (and it’s pathetically disorganized announcer started making loud confusing statements over the loudspeaker) men in black with dark glasses rode into town on beautiful horses just to show off, while others piled 3 little kids on top of a very patient horse and paraded them through the streets. Finally the huge powerful draft horses arrived weighing in at 1200 kilos (2640 pound), and mingled with a high- stepping Friesian before going off to “get dressed,” and even the polizia showed up on horseback, riding elegantly through the streets. Though the main piazza of town is partially ruined by a hideous modern building in shockingly bad taste next to the mother church, Scicli possesses a lovely historic center of baroque buildings, including the town hall, numerous churches and lavish private palazzi. I found the best place to watch the horse cavalcade was on a narrow side street, which was not only surprising free of spectators it was also far enough away from the annoying PA system so that only the clip-clop of horses hooves and the jangling bells could be heard. The street itself was lined with lovely baroque buildings that captured the feeling of stepping back in time, with some lucky spectators viewing the festivities from their balcony. 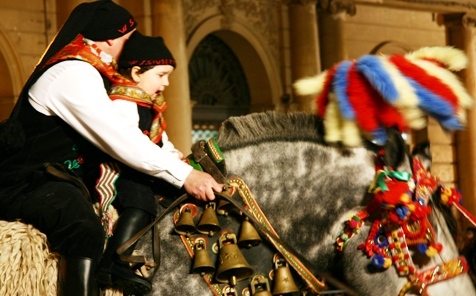 The following day, the six competing costumes, this time senza cavallo, are displayed in the piazza so they can be examined in the light of day. The winner receives a bronze statue by Carmelo Candiano that depicts the holy family’s flight into Egypt, which is kept for a year, and then re-assigned to the next year’s winner. There is also a fund to reimburse all the participants for the cost of flowers. Typically, none of this takes place without disagreement. Old-timers in Scicli will wistfully tell you that the festa ain’t what it used to be, as the tradition of lighting numerous bonfires – called pagghiari – was outlawed after gas lines were installed under the city streets. (Some people really know how to ruin a good party.) Some claim the rules for the design of the frame for costumes were violated, purists bemoan the lack of tradition in the flower designs, while an animal rights group claims the horses suffer under the headdresses and wants the festival to be outlawed. In spite of all that, I found the Cavalcata di San Giuseppe Festival to be colorful and unique, and the town of Scicli is worth a visit. Scicli is in eastern Sicily about 20 km from Modica, and 5 km from the seaside on the southern coast. The Hotel Novecento in the historic center is a delightful 7-room hotel, within walking distance to a number of good restaurants, such as Baqqala, located along the route of the Cavalcata.